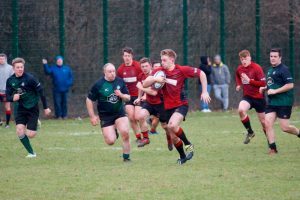 The Linlithgow team departed for Edinburgh to play the team lying second in the league expecting tough competition from Forrester. The game started with Kevin Wilson for the Reds kicking off and from the first contact with the opposition PJ Singleton went down after a strong accidental blow to the head from a players knee. PJ sadly had to depart the field after the shortest appearance in a Reds shirt the manager can remember and Lewis McKie took his place from the bench. 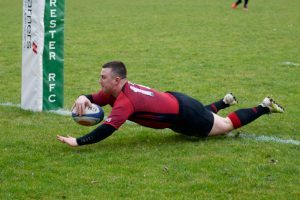 The game was not going the Reds way as this Forrester team had a number of well built heavy players who took a bit of stopping when they rumbled the ball in close quarters at our much lighter forwards. The Forrester team were making good ground and the Reds were struggling and frustrated by this approach. This resulted in a large number of penalties against the Reds as they were deemed to have infringed for one reason or another. At this stage some individual backs like Bruno Mochrie and Ally Walker were making ground but the continuity could not be maintained. The result was that Forrester scored the first try and Linlithgow needed someone to lift the lethargic play and careless mistakes. 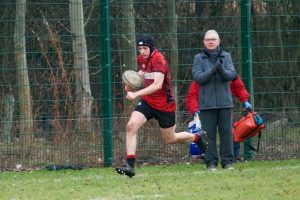 It came from the restart when Lewis McKie won the ball at the kick off, the ball was set up in a ruck and came swiftly from Robbie Thomson to Kevin Wilson who hit Ally Walker in full flight. 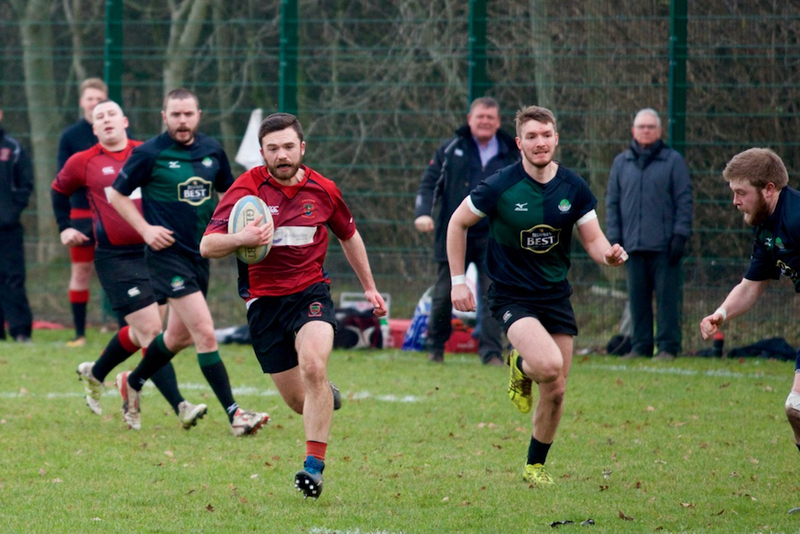 Ally tramped over his opposite number, the opposition full back decided to avoid a possible fatal encounter with a large fast centre and Ally Walker strolled over for the try, which Kevin Wilson converted. 7-5 for the Reds. The Reds now scored a nice try by passing the ball across the backs and Mayo Herdman cut through in mid field to score below the posts. Kevin Wilson converted. 14-5 for the Reds. 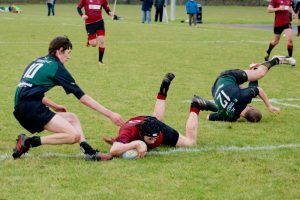 However as often happens in these cases a couple of careless errors let the Forrester team into the 22. 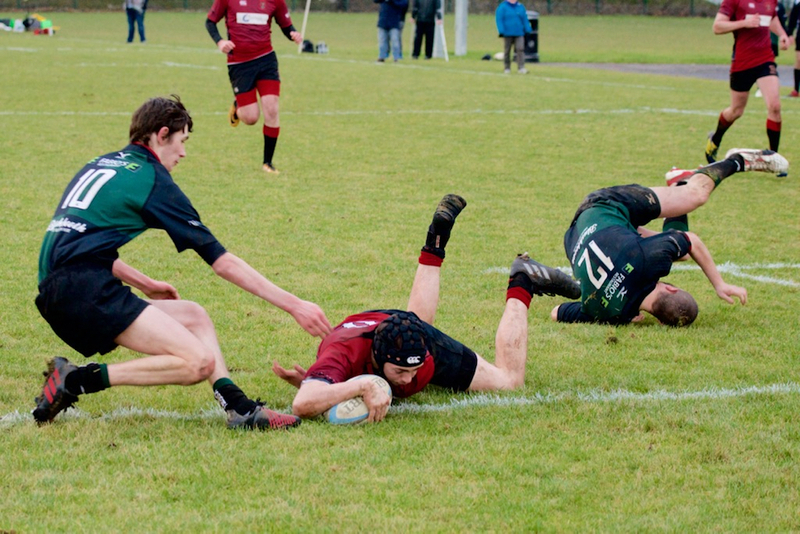 From a line-out the Forrester wing forward strolled past sleeping defenders to score below the posts. 14-12 to the Reds. Fortunately the Reds battled their way down the park and were awarded a penalty on the opposition 10 yard line. Debate enthused but Kevin Wilson had faith in his boot to attempt and score a penalty to put the Reds 17-12 up at half time as the whistle blew. Some changes were made at half time as Kyle Dunlop, Fraser Rankine and Rory McAdam came on from the bench which resulted in a bit of reshuffling. Bruno Mochrie went into the back row and Kyle Dunlop joined him there with Gus McNab moving to second row and Kevin Stump being replaced. Kevin Wilson was replaced at standoff and James Timlin moved in to that role. Before long the combination of Mochrie and Dunlop working closer to the ruck but with pace and strength came up with the goods. Bruno Mochrie scored a great individual try where he sidestepped his way through the middle of the opposition leaving a few of the large heavier forwards gasping in his wake and ran below the posts. 24-12 to the Reds. 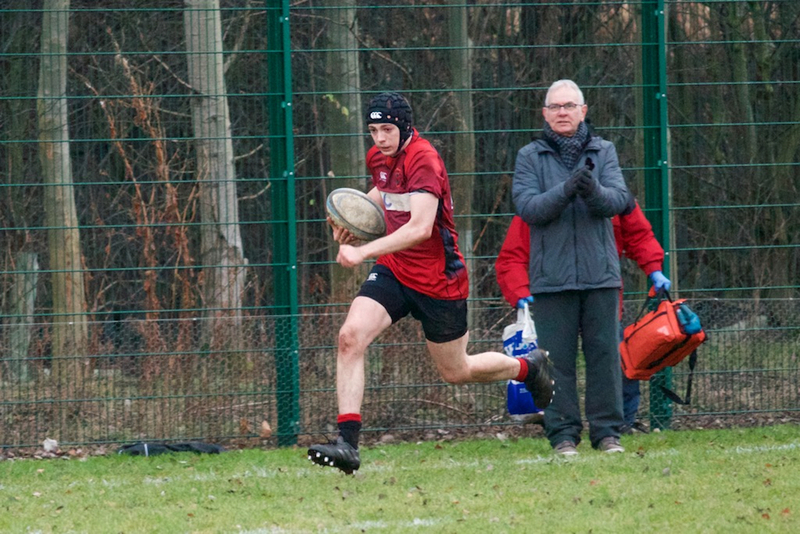 The next try was scored by Kyle Dunlop, set up by a good backs’ move where Fraser Rankine at centre slipped the ball to the supporting Kyle Dunlop who scored. 29-12 to the Reds. The final score was a combination of Mochrie and Dunlop again with Kyle Dunlop showing his pace on the wing to streak over for a final score. 36-12 to The Reds. A sticky game at times which could have ended with the wrong result, turning out good in the end. Good teamwork and commitment by all, listening to advice and following the basic principles of rugby.